SHEFFIELD, Mass. - There's a lot of uncertainty in the world today, globally, nationally, locally. Even on a personal level, uncertainty can be nerve-wracking. Twenty years ago, Dale Webb was doing well. He was newly married, starting a family and had a good job. "I went to Penn State for mechanical engineering and wound up working in the corporate world, mostly with medical devices," he explained. As it sometimes does, life hit a sour note and his position was eliminated. That was okay with Dale and his wife, Phyllis. They had a plan. They were going to start a business making ukuleles. It was something neither of them had any idea about. "Totally out of the blue. Neither one of us could be qualified as musicians," admitted Phyllis. Phyllis' brother was a musician though and was tired of lugging around his guitar. He suggested that Dale use his engineering know how to make something more portable like a ukulele and Dale got to work. "He wanted to design everything from scratch, so he created all of his own materials and built the first parts in our toaster oven and our oven at home," explained Phyllis. His designs were unique and the sound was rich. After showing off some prototypes at a trade show in 1999, orders started pouring in. "We built the first 10,000 ukes in our basement," noted Phyllis. They named their business The Magic Fluke and word spread. Musicians from around the world were lining up -- including celebrities like Tony Danza and Bette Midler, who played one of The Magic Fluke's pineapple-shaped ukuleles in her shows in Vegas. "The market has grown probably 10 times," noted Dale. After years of obscurity, the ukulele has staged a comeback -- perhaps due to popular music, perhaps due to its compact size or that it's easy to learn to play. Whatever the reason, ukuleles are no fluke. Sales have rivaled those of guitars in recent years, forcing Dale and Phyllis - now the largest shippers of ukuleles in the United States, out of their basement and into the new Magic Fluke shop in Sheffield, Mass., where they still make everything by hand -- just not in the toaster. "It was a big leap of faith, but here we are 18 years later and we really believe in what we do," affirmed Phyllis. IF there is a ukulele stashed in your closet, chances are that it's a flimsy model bought during a Hawaiian vacation. It might have been played once upon your return home, at which point everyone within earshot complained about its shrillness. And so it was cast into storage, to languish beside old blankets and jigsaw puzzles. Dale Webb attributes your uke's sad fate to manufacturers who envision their products as souvenirs first and as serious instruments second. Mr. Webb has flipped those priorities with his Fluke line of ukuleles, which are engineered to produce clean tones and rich vibrato -- and not to fall apart if accidentally banged against a coffee table. Before being laid off from his job as an ultrasonics engineer in 1998, Mr. Webb had never played a ukulele, let alone built one. But his brother-in-law, Jim Beloff, is a longtime enthusiast, and he encouraged Mr. Webb to try his skilled hand at making a prototype worthy of true musicians, rather than tourists. Mr. Webb said he researched some widely available ukuleles. "I took one look at the traditional uke, and it wasn't appealing at all," he said. "It was this little shrunken guitar, and it was cheap and boring." Using his kitchen oven, Mr. Webb baked several plastic shapes, seeking a ukulele body that would please both eye and ear. He eventually settled on a rounded arrowhead shape, which makes the Fluke look more like a space-age lute. Though he kept a wooden top for the body, Mr. Webb went a less traditional route by molding the fretboard, or the front of the neck, out of urethane. In 1999, after some positive feedback from music-store owners at a trade show where he showed off some prototypes, Mr. Webb refined his design with the aid of stereolithography. This involves entering a product's dimensions into a computer, which in turn instructs a refrigerator-sized machine to build a three-dimensional model using lasers and liquid plastic. Examining these ukulele mock-ups helped Mr. Webb work out the kinks, like errant curves in the body, before production started later that year. All of this detailed craftsmanship means that the Flukes cost more than what is typically available at Waikiki Beach gift shops. The least expensive, solid-colored Fluke sells for $179; adding a body design, like flames or stars, and a rosewood fretboard can push the final tally close to $300. The most recent addition to the Fluke lineup, a model with a koa top, sells for $365 unadorned. Mr. Webb and his Magic Fluke Company have sold 24,000 Flukes so far; most sales have come through his brother-in-law's Web site, flea market music.com, though the ukes are also available at retail outlets like Mandolin Brothers on Staten Island. If you think that a few hundred dollars is a mighty sum for a ukulele, Magic Fluke also offers a $59 version called the Fortune Soprano. It's imported from China, where most cheap ukes are made. But Magic Fluke promises that the Fortune still sounds pretty good -- perhaps not as good as the Fluke, but good enough to keep it out of hall-closet purgatory. It's many moons back in 2012 since I first looked at a Firefly Banjo Ukulele from Magic Fluke musical instruments. And I really rather liked it too. I'm therefore thrilled to be looking at their latest re-vamped tenor version. And whilst I liked that original soprano Firefly ukulele for many reasons, I recall a lot of people getting quite sniffy about it being essentially just a 'drum with a neck bolted on'. Aside from the fact all banjos are essentially just that anyway, I really liked the light as feather construction coupled with great tone and it just 'feeling' right in the hands. But yes, I guess it WAS very simple really and not super cheap either for what it was. It also wasn't adjustable either. Fast forward to 2017 and we have a completely different proposition in the newest tenor model from the Massachusetts based brand. So whilst this one is still a banjo uke, out goes the High Pressure Laminate pot with the drum head that was attached with a kind of edge stitching and in comes a maple ply pot which looks like, well, it looks more like a banjo really! Yet at the same time.... it also doesn't.. Where are the outer tensioners that you normally see on a banjo? How is that head being held in tension? Where is the tone ring? Well, always the clever innovators, Magic Fluke have kind of turned the banjo concept upside down. On the underside of that outer wooden rim and inside the banjo is the steel tone ring that is bolted into the outer wood rim and adjustable using an allen key in one of the ten bolts visible on the front. Looks wise it reminds me a lot of the old Keech banjoleles and I think looks great, clean and simple. It also means that, unlike the smaller original Firefly ukuleles, this one has a head that is both easily replaceable and tunable too. Incidentally, that head is the same 8 inch diameter Remo as the others whilst the overall diameter is 9.75 inches. Nice. Otherwise we have similar appointments to the other Firefly banjos too with a chrome tail piece and the same sort of three footed floating bridge you see on most banjos. Looking in the back we also have a similar designed pole piece running from the end of the neck and attaching to the pot with a kind of nifty locking wooden piece. It does also look like you can adjust the neck for action by removing or adding washers at the tail end. Neat. We also have the trademark Firefly embossed logo and the hand numbered makers label too. That pole piece is made of hard maple as is the tenor neck, and is a thing of beauty. I am always a sucker for a maple neck, particularly one with a pale fingerboard like this. It's not quite the same sort of technique as employed by Deering on their Goodtime uke banjo where those frets are set directly into the neck, but I still think this looks great. And unlike some other Fluke instruments, the plastic fingerboard is not an option on this one - just wood. What type of wood it is, I am not totally sure, but I think it's a slightly darker maple. In fact all of the wood on this is finished very nicely in a smooth satin that just feels of good quality. I am not sure what the nut is made of, ebony perhaps, but like on other Fluke necks we have a zero fret meaning the nut action and intonation are controlled very well by this instead leaving the nut for setting the string spacing only. Beyond this we have the ubiquitous Fluke headstock shape that people either love or hate (I love it incidentally). In standard spec these come with entry level Grovers that Fluke use widely on other instruments. They are not the best in the world, but not the worst either. Magic Fluke do offer these with a Pegheds option for another $75. Personally I would save your money and if you find that you don't get on with these Grover pegs, spend half the cost of Pegheds on a set of Grover 6's as they should be a straight swap. Don't get me wrong, I do like Pegheds, but just find them over priced. Other options on offer include a shaped soft gig bag for $59 (that I really think should come as standard) and a pickup system for $89 (for those sadists who want to make a banjo even louder...). In vanilla spec though it comes like this with a set of D'Addario Nyltech (Aquila) strings and comes in at $389 or £349 which may make the people who still think all ukes should cost $50 gasp. It is however far cheaper than the RRP on the 17" Tenor Deering Banjo Uke that will cost you best part of $200 more. It's also comparatively priced to the, now in production, Duke 10 Banjo Uke which is terrific. It's also completely made (and parts sourced) in the USA as close to Massachusetts as possible. So there is no Chinese factory involved here either. And as well as being cheaper than the Deering it's also much lighter - more comparable to the Duke at about 2lb in weight. So maybe it's the Duke 10 that this is going head to head with more than the Deering? It's much heavier than the original Firefly banjos of course, but that stands to reason with that extra body rim. Build quality, as I have hinted at is truly excellent. It really always is with Magic Fluke stuff and I knew it would be too before it arrived. It just feels right in the hands. The light weight, the smooth as silk satin all comes together for a nice feeling instrument. And its really helped by the fact that they are not using standard tension hooks so there is nothing to dig into your strumming arm. Just smooth maple. It really is very comfortable. In fact I can't think how a banjo could be any more comfortable. Sound wise this is a joy. It's far brighter, louder and sharper than the earlier soprano version, and more, well, more like a banjo really. Being an 8 inch head it's not up there with the massive punch of something like the Deering, but it's really no slouch at all. In fact it's extremely lound and punchy and with more guts than some other 8 inch head banjos I have played. It's just so precise and snappy. Intonation is really good once you have set the saddle (thank you zero fret) and the comfortable neck means it's easy to play and move around on the neck. But what has really impressed me is how controlled it seems to be with those hollow echoey sounds that banjos can create. The Deering did it, the Duke 10 did it, and people say 'oh you just put a cloth inside'. And yes, yes you do, and that works, but this Firefly doesn't seem to have that problem in the first place. There is no echo. No ghost notes. Just really clear notes whether you pick it or strum it. It's remarkable really, and has left me wishing this didn't have to go back. Yes people may still raise an eyebrow at the pricing, but as I say, this is right on the money with the competition, and in fact cheaper than some notable others. Magic Fluke have done it again methinks and this would now be my go to choice for a tenor ukulele banjo, no question. Highly recommended. Many thanks to them and to the UK distributor of Magic Fluke, Mark Pugh of Stones Music for setting me up with this for review. Don Johnson fits a string nut for a bass at The Magic Fluke in Sheffield. SHEFFIELD — If you've noticed there seems to be a lot more people playing ukuleles than there used to be, you can blame that on Dale and Phyllis Webb of Sheffield. Tracing the ukulele's resurgence in popularity after the happy little guitar's appeal dipped from a post WWII-high in the 1960s leads right back to the Webbs' basement in 1999 back when they lived in Hartford, Conn., according to ukulele virtuoso, musical historian and author Ian Whitcomb. Challenged by his brother-in-law, Jim Beloff, a musician and early adopter of the ukulele, to create a quality uke that could be purchased outside of Hawaii, Dale Webb set to work consuming everything ukulele-related: books, recorded music, actual ukes. He used his skills as a veteran of the molded plastic industry to create a black plastic back of a ukulele. It was the invention of the molded backboard that has allowed Webb to keep the price of the instrument down while dialing up the awesome on the front boards and designs, fretboards, strings and necks. Dale Webb named his new design the Fluke. It's a bit larger than concert ukuleles and produces a louder sound than traditional ukes. Flukes can be recognized by their unique silhouette and vivid front board art. "There's a lot of interest that people have in this business. People are passionate, whether you're dealing with ukulele fans, players or performers," Dale Webb said. "It's a good business to be in. The ukulele has grown in popularity beyond our wildest dreams." 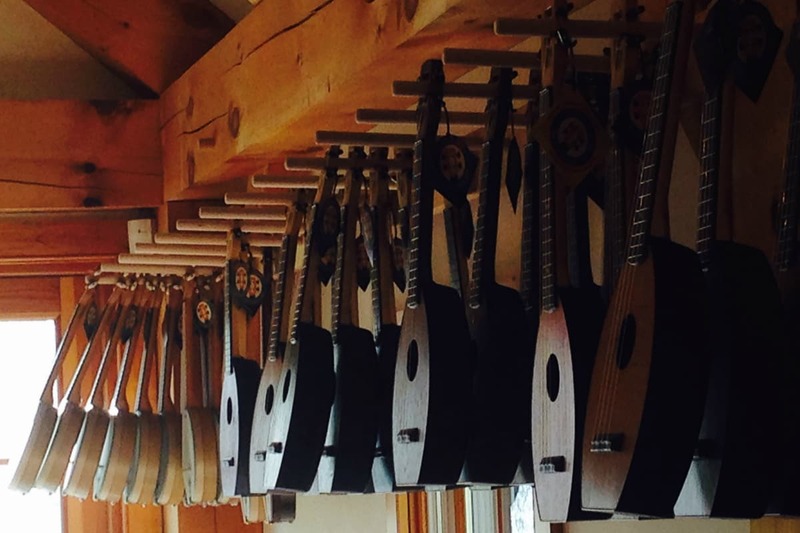 Magic Fluke makes about 4,000 ukuleles and other stringed instruments a year. The pieces are sold internationally in around 100 stores, Webb said. From 2009 through 2014, the most recent information available from the National Association of Music Merchants, the number of ukuleles sold annually doubled from about 500,000 to 1,000,000. People in the U.S. spent $74 million on ukuleles in 2014, up from $33 million in 2009. 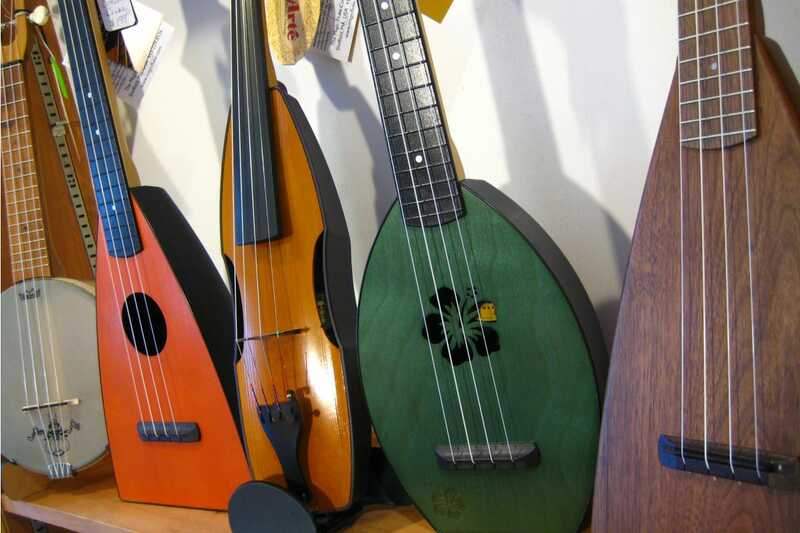 Still, the tiny guitars — first developed in Portugal, but popularized in Hawaii — only make up 3.9 percent of the stringed instrument market, according to the music merchants association. Dale Webb said Magic Fluke has been riding the highs and lows of ukulele popularity for 20 years, but this new life direction just sort of happened — a fluke. Weary of the corporate world he was working in, Webb took his new design to a trade show to see if there was any interest in his new take on an old instrument. He racked up more than 100 orders and this series of fortunate "eh, why not?" moments has led to the founding of the Magic Fluke ukulele brand, a new life for the Webbs, and a whole lot of attention from a growing ukulele fandom. In a 2012 interview with Off-Ramp, a weekly Southern California arts publication, Whitcomb makes Beloff sound like a ukulele evangelical. Beloff took Webb's updated take on the ukulele around with him touring the West Coast, starting uke groups, and spreading the joy of the notoriously easy and fun-to-play instrument. "There were various ukulele clubs that formed on the coast, we're going back 20 years, so it started here, gradually spread," Whitcomb said. "When the recession began, people could afford to play ukuleles; they couldn't necessarily afford to buy expensive instruments anymore." Walking into the Magic Fluke on Main Street feels like you're entering Ukulele Graceland — bring a camera. Greeting people at the door is a wooden ukulele about eight feet high on loan from the Ukulele Hall of Fame Museum in Rhode Island. On the right is a hallway of finished ukuleles hanging from the rafters and on the walls featuring expressive front boards with wild colors, intricate details and all kinds of themes, including Hawaiian. Color is added to the wood with a dye sublimation printer — the ink is injected into the wood instead of done in an overlay or with paint. The ukuleles produced by this six-person company can get expensive — Dale Webb shows a ukulele with a front board made from difficult-to-get Hawaiian koa wood — but Flukes start around $200. Dale Webb points to a few of Magic Fluke's newer products: violin, banjo and bass. Each one has the signature black plastic back of Magic Fluke instruments. Maintaining a strong presence in the uke community means a lot of networking, going to trade shows and keeping the business local, the Webbs said. The couple use molders in Connecticut, and get wood and parts from the Berkshires as well as Vermont. The Webbs are active in getting their Flukes into library instrument loan programs including those in Sheffield and Falmouth, as well as schools. "They're durable and affordable," said Phyllis Webb, "which makes them perfect for students and numerous classes." Growing with the niche industry has had its challenges, Dale and Phyllis Webb note. The hardest challenge, Dale Webb said, is as an owner of a small business, you end up doing everything for a job to get done; that means marketing, design, manufacturing, billing, accounting, permitting, purchasing, shipping, cleaning the toilets, everything. "It's really, you just take it one step at a time," Dale Webb said. "We bootstrapped a lot. We went to tag sales and bought furniture, my dad built some of our work tables. He made parts for us, too." The future of Magic Fluke is all about staying competitive, Phyllis Webb said. To that end, she took a small business course with Goldman Sachs and has plans to expand the instruments Fluke offers and get more Flukes into libraries and maybe hospitals and nursing homes, places where they'd be unexpected, but possibly helpful. "They're such a happy instrument," Phyllis Webb said. "They're easy to pick up and learn." Dale and Phyllis Webb have made it a lot easier to be a gypsy. Dale, a formally trained engineer, and Phyllis, the sister of ukulele guru Jim Beloff—yes, the Beloff who helped arrange Eddie Vedder’s Ukulele Songs—design and manufacture ukuleles and other nontraditional instruments from (mostly) locally sourced walnut, maple, and cherry. The instruments create a righteous, solid sound and fit in the trunk of a car, a suitcase, or even a beat-up backpack. “From the young kids who like that it’s small, to the elderly who have memories of their grandparents playing, everybody is our potential customer,” says Phyllis. This story originally appeared in the December 2015 Take magazine, available here. NEW HARTFORD/SHEFFIELD, MASSACHUSETTS — Dale and Phyllis Webb remembered when they were just starting out as a business. The Magic Fluke Co. began in the basement of their New Hartford home in 1998. Dale had been laid off from his corporate medical-device engineering job, and he and Phyllis had three small sons at the time. The Webbs had been inspired by the latest ukulele revival and by Phyllis’ brother Jim Beloff, an accomplished ukulele player and publisher of sheet music. They realized that there was a dearth of affordable options when it came to the ukulele and other stringed instruments. At the time, while trying to justify the expenses of a fax machine and an Internet connection, Dale constructed the first musical instruments using a combination of wood and plastic materials designed with acoustic performance and manufacturability in mind. He made the first prototype using thermoformed parts from the kitchen oven. Little did they know what would happen next. Dale explained the origin of The Magic Fluke Co.’s name: “The name Fluke has the word ‘uke’ in it [short for ukulele], and my original uke body design was similar to the flukes of a whale’s tail, so we decided to call the first instrument the Fluke Ukulele. Adding ‘Magic’ [to the name], was just a whimsical association to Mozart’s famous opera – and in keeping with the musical theme.” He referred to Mozart’s 1791 work “The Magic Flute,” in which a prince is induced by a supernatural being to undergo trials of initiation, which he fails but is rewarded for anyway. The difference between Mozart’s work and the Webbs’ is that Dale and Phyllis took a chance and succeeded. In January 1999, they showed their new type of colorful ukuleles at the National Association of Music Merchants show in Anaheim, California. NAMM is a national and international retail association whose members include commercial companies, distributors, affiliates and manufacturers. “We were the only ukulele-exclusive exhibitor with three prototypes and a box full of Jim’s books,” Dale said. They went home with orders for dozens of instruments and production of the instruments’ back shell mold commenced. In 2003, the company had grown out of the Webb’s basement and into a renovated, historic gas station in New Hartford. Today, the business produces about 4,000 musical instruments per year — more than 55,000 since its inception; has dedicated corporate and celebrity clients; and, since 2011, has been run out a tan-colored, 4,000-square-foot, timber-framed, solar-powered office in Sheffield, Massachusetts. In keeping with the town’s thriving arts and music community, the Webb’s products are uniquely-shaped, colorfully-patterned, and are sourced from local and U.S.-made materials. In going against the competitive, inexpensive import market, The Magic Fluke Co. has become a force to be reckoned with in terms of accessible prices and manufacturing. Dale has said that plastics can have properties close to or surpassing the quality of wood. Also, an advantage of plastics is the ability to design complex assembly features and shapes into the molded parts that would ordinarily, in wood form, contribute to a high price tag. Dale said the musical instruments their company makes are consistent, high-quality, durable and affordable. The instruments’ faces’ water-soluble “trans-tint” dye yields such striking colors as sapphire blue, mango, hibiscus red, and citron yellow. Some are in sunburst patterns, others sport leopard prints. The neck and tops are made from a variety of woods, including walnut, maple, koa, and Adirondack red spruce. In addition to their considerable celebrity and corporate sales, the company has provided instruments for the elementary-school band at Sharon Center School in Sharon. Compared with handmade, solid-wood, and high-end instruments priced at $5,000, Dale says their instruments start at $189. Their original instrument, the Fluke Ukulele, departs from the traditional “small-guitar” ukulele shape with its injection-molded thermoplastic and flat bottom, which means it can stand on end. Another of their popular products, the Firefly Banjo Ukulele, combines the ease of playing a ukulele with the distinctive twang of a banjo. Weighing in at less than one pound, the instrument is available in tenor, concert, and soprano sizes. “It was extremely well-received,” he said. One of the company’s newer products, the Cricket Violin is a full-scale yet thin and aerodynamic-looking violin whose body is molded of glass-reinforced, durable thermoplastic. A viola scale is also available for this instrument. Phyllis and Dale have been involved with their communities for years. Phyllis served as a New Hartford Selectman from 2007 to 2009. She and Dale were involved in the recent preservation efforts of Sheffield’s Dewey Memorial Hall, a local historical performance space dating from 1887. Dale was also involved in the Eagle Fund, a grant-making organization serving to promote educational opportunities to students and teachers in the Southern Berkshire Regional School District. Dale said, “I like to design. I also design a lot of furniture, and I am working on a vehicle, a customized dune buggy, which has been a 15-year process.” The vehicle is a 1971 Volkswagen Karmann Ghia. It has been said that in 1879 the ukulele was brought over by Portuguese explorers to Hawaii, where the instrument was given as a peace offering to the islands’ locals. The locals thought the instruments’ players’ fingers moved like “jumping fleas,” hence the Hawaiian name for the instrument and its inclusion in the region’s musical history. The Magic Fluke is open Monday through Friday, from 8:30 a.m. to 4 p.m. Weekends and holidays are by appointment. For more information call 413-229-8536, email sales@magicfluke.com or visit www.magicfluke.com. In a solar-powered timber home overlooking mountains and fields in Sheffield sits Magic Fluke Company, a ukulele-manufacturing business. Inside, an immediate perfume of freshly cut birch, walnut, maple, and other woods fills the space around you. A white, mild-tempered chihuahua greets customers at the front door, giving them a once-over before carrying on happily within this shop filled with hundreds of ukulele parts lining its walls. In one room, a worker is sanding down the neck of a “uke” as a stream of sawdust is captured in sunlight cascading through large, open windows. There is a creative energy to this place and a home-like environment that welcomes musical curiosity. Dale and Phyllis Webb moved their family business to this area in 2010 after expanding to a much larger space than the one in the basement of their home 11 years prior. Dale, the engineer behind the designs of Magic Fluke, began the company when he was “fortunately” laid off, as he says. His brother-in-law, Jim Beloff, convinced him that the ukulele was on the verge of a comeback and wanted him to come up with a quality instrument made in the United States. After years of what felt like just trying to hang on to the business, the ukulele did in fact make a resurgence. To date, Magic Fluke has built and shipped over 60,000 U.S.-made instruments. Bette Midler also gave the instrument a good push toward renewed popularity. The entertainer, a Hawaiian native, wanted to reconnect with her roots and learn how to play the ukulele in her shows. Beloff, who received a lot of attention for his uke books, was asked to give Midler lessons. She was hooked and started using some of Magic Fluke’s ukuleles in her shows. In the front of the shop, there is a poster of Midler in her showgirl outfit holding a pink-pineapple ukulele that was crafted by Magic Fluke. Dale and Phyllis are committed to keeping their instruments locally crafted. But competition from China is strong, with imported instruments selling at a cheaper price—though oftentimes of lesser quality. Phyllis explains how difficult but important it is to do everything locally. For instance, she says that finding “Made in the USA” tags for the company’s merchandise were hard to find—even those labels were produced overseas. On the other hand, some of the harvested ash, cherry, maple, and walnut come from the couple’s own trees or in surrounding locations. The time and energy that goes into the instruments does not go unnoticed. Despite their apparent fragility, ukuleles that are made well will last a long time, says Phyllis, noting that their ukes in children’s hospitals have stood up to being wiped down by bleach every day. Dale and Phyllis continue to expand their instrument repertoire, which includes the ukulele and electric ukulele as well as the violin/fiddle and banjo uke. They can barely keep up with orders of their newest creation, a travel-size electric bass, called a timber. For the couple, there is no better place than Litchfield and the Berkshires, and they regularly give back to the community while keeping their business as authentic as when they started. Phyllis sees their Route 7 location as a creative, casual space where people can walk in and strum a ukulele. And so the Magic Fluke is yet another example of the dynamic music and arts vibe found here, with endless possibilities to explore and share. It’s the 1920s. Picture a canoe drifting on a moonlit lake, a young swain in white linen pants, a trendy pink shirt and straw boater hat picks out a tune on a ukulele, wooing his lady love. The instrument’s popularity has just jumped to the mainland from Hawaii, where it was introduced by the Portuguese in 1879 and quickly became the islands’ national instrument. Flash forward to 1950s television where nasally Arthur Godfrey, sporting a Hawaiian shirt, is giving on air lessons to millions of viewers. Try a 1960s image: Lank-haired Tiny Tim, playing the now-kitschy soprano ukulele while warbling Tiptoe through the Tulips in a falsetto voice. Not very hip stuff. Or is it? Ukuleles are making a strong comeback: the National Association of Music Merchants reported a fifty-four percent jump in ukulele sales in 2013. Ukulele music festivals have sprouted across the country. The ukulele is back from musical oblivion and thriving in places as diverse as England, Canada and Japan. Riding the crest of this wave is the Magic Fluke Company in Sheffield, MA. Started by Dale and Phyllis Webb in 1999 in New Hartford, Conn., the business was inspired by Phyllis Webb’s musician brother, Jim Beloff, who had discovered the ukulele years earlier and now teaches the instrument to acolytes. The Webbs decided to produce an affordable, USA-manufactured uke. Orders started pouring in and, after a mere decade, the couple had introduced dozens of colors and designs and shipped more than 55,000 instruments. They moved to their solar-powered Sheffield location in 2001, where they enjoy the vibrant musical and arts environment - and try to keep up with the explosion of interest in the instrument.